← Twas the Night before Surgery…again. Merry Christmas everyone! Per usual I spent another major holiday in hospital. It wouldn’t be a true Jess style crisis if I did not align it with a holiday. In the future you should be MORE concerned if I have a health concern on a normal day. The procedure went well. It ended up taking longer than expected. I believe that overall I was on the operating table for 4 hours. I had a wonderful surprise! Dr. Greenberg (you may have read about her last February when I had the bowel obstruction) jumped in on the surgery! It was comforting to know she was there alongside Dr. Robison. My oncologist removed the mass on my liver and zapped off a few other spots that we did not see on the CT scan. The other spots were on my intestine and bowel but luckily there was no need for another bowel resection. Apparently there was some excessive bleeding during the surgery because of the way the liver had to be positioned while the surgeons removed the tumor. They kept me in the ICU overnight as a precaution. I woke up in the recovery room in a lot of pain. It was well managed once I got into the ICU. So well in fact that I have little memory of anything but clutching my gut in pain as it spasmed at the slightest touch. I don’t believe that I left my bed at all on Saturday. I recall being in a lot of pain. Apparently I had to be so highly medicated that I would be talking to my parents and all of the sudden I would just fall asleep mid conversation then wake up and carry on as if nothing happened. I did the same to my brother when we FaceTimed that night. It was nothing short of entertaining I’m sure. Unfortunately I got really nauseous Saturday into Sunday and threw up the small amount of liquid that was in my stomach. I went from NPO (no food/drink by mouth) to a clear liquid diet but I could only tolerate water. My big mistake was taking three sips of cranberry juice. BLEH. How dare I? I woke up the next morning with a wicked headache, horrible abdominal pain, and nausea. Luckily they found the right combination of medication to make me feel a little better on Sunday. I hit small milestones. I was able to get out of bed and take small walks down the hall. The catheter came out and after lots of “tricks of the trade” like blowing bubbles through a straw in water and pouring peppermint oil into the toilet, my bladder remembered how to function. The bright side is that I no longer had a catheter, the downside was having to make the grueling 5 foot walk to the bathroom. It’s surprisingly taxing. I can now walk to and from the bathroom without calling a nurse to spot me. Early morning was rough. At 3am my nurse was supposed to bring me pain medication but after checking my vitals and seeing that my oxygen wasn’t great she ordered a chest X-ray instead. 4 am I was woke out of a dead sleep. A woman wheeled a big machine into the room. She placed a big cold metal sheet behind my back and a heavy lead apron on top of my belly (ouch). She snapped a quick x-ray and left. I laid in my bed in pain until my doctors came around to do rounds. Though I am appreciative of my nurse being cautious, it was a bit much. Even the doctors were like “wait, really?” I spent the better part of the morning playing pain management catch up. And you know what? It blows. As of that night I was cleared to eat solid foods, I switched to oral painmeds, and I was allowed to take walks around the 4th floor by myself. Honestly it was a very lonely night. When I say lonely I don’t mean that I necessarily needed to be with people 24/7. I would have been just as lonely if my parents had stayed all night. Being in the hospital after a recurrence when you are perceiving everyone else in the world to be happy/laughing/dancing/eating/drinking/exchanging presents is isolating. Social media is a double edged sword. In many respects it made me feel uplifted to receive so many kind messages of support. In other ways it felt like I was on the outside looking in on so many warm and happy moments. Moments that I couldn’t manufacture no matter what, simply because of my own circumstances. I want nothing more than my friends and family to have the BEST experiences possible. I’m not saying if I can’t be happy, no one can. It made me feel guilty for feeling jealous and down on myself. In the wee hours of the morning I knew I was ready to come home. I didn’t sleep well and I listened to the woman in the room next to me cry uncontrollably all night. My heart broke for her. Over the past few days I gathered that she has a newborn and considering that she was in the oncology unit it goes without saying what she is going through. I don’t know who she is but please pray for her. I had another visit from Dr. Greenberg before the doctors did rounds. She wished me a Merry Christmas and we made plans to hang out as soon as I’m well. I’m holding her to that. She shared the other day that she is considering going into Gyn Onc. I hope she does. She was born to do this. Shortly after Dr. Greenberg left the doctors rounded and said that I was being released. THANK GOODNESS! Get me the hell out of there. Before I left a lovely nurse, Anne, taught me how to inject myself with Lovenex, an anticoagulant. Despite facing many countless needles in the last year, it was terrifying to inject myself. I did it and feel confident that I can do it for the next month. I settled home at my apartment in Providence in late morning. I promptly passed out in my own bed for about 3 hours. Mom and Dad have taken great care of me despite me being a terrible patient and wanting to do everything myself. They are staying nearby through the weekend to help me transition. I am in a lot of pain but can manage by myself with a lot of things. I will still definitely need help. When I figureout what that is, I will let you know. Thank you for everyone that visited, called and texted over the last few days. It kept my spirits up. 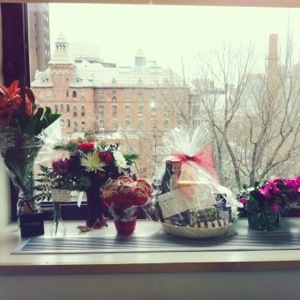 The flowers and gifts were so kind and generous. Thank you, thank you, thank you. I hope everyone had a lovely holiday with their loved ones. You made it home… new beginnings!